A Crazy Canuck Living in Zany Italia! : From a buffoon to a genius? A Crazy Canuck Living in Zany Italia! From a buffoon to a genius? 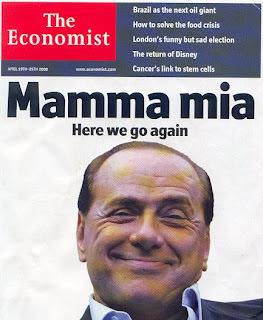 The April 19th edition of The Economist slammed on its cover (see picture) our beloved leader, Silvio Berlusconi, who for the third time now has been elected prime minister of Italy. This is by no means a first for good’ol Silvio as in the recent past the prestigious British magazine has put him on the cover several times, with such titles as, “Why this man is not fit to govern Italy”, and other fun-loving titles such as this recent one, which basically warns Italians to NOT vote for him (which they didn’t bother listening to the Economist’s warning and did vote for him instead of Walter Veltroni, Rome’s former mayor). The title is taken from an old Abba song and personally speaking, isn’t THE most respectable title one can give to a political leader. And the pic of Silvio isn’t exactly one of the nicest around either. In fact, it makes him look like a clown, or better, a buffoon. While Italy has to a certain degree fallen in shambles (the Alitalia affair which no one seems to want and is losing zillions of euros, the on-going and nauseating garbage issue in Naples which seems to have no end in sight and which can only get worse with the warmer weather, and other “funner” things which seem to pop up on a daily basis in Italy), the Economist comes out with a wee bit of refreshing news with their April 26th issue: it has spoken VERY highly of Sergio Marchionne, the managing director of Italy’s largest company, Fiat. The title of the four-page article on Fiat is: “The miracle of Turin”. “By the time Sergio Marchionne came along in 2004, most of the beauty had gone and the stiffness had become sclerotic. Born in Italy but educated in Canada and schooled in business outside the car industry, Mr. Marchionne combined an insider’s sense of how the system worked with an outsider’s vision of how badly it needed to change”. A bit of Canada in Fiat’s success? Perhaps yes seeing that Marchionne’s first university degree was in law from Toronto’s prestigious Osgoode Hall and his second degree was an MBA, again from Ontario. He was born in the town of Chieti and moved to Canada when he was young. No doubt his Canadian upbringing and education has been a “jolt” to the Italian industrial sector which, according to Italian journalists, is in desperate need of a change vis-à-vis its current managers. “He is the antithesis of the archetypal smooth Italian executive, in part that may be because Mr. Marchionne, though Italian-born, grew up in Canada, where he qualified as both a lawyer and an accountant. His approach to business is decidedly Anglo-Saxon, as is his frequent use of expletives. He demands complete openness, fast communication, accountability; he abhors corporate politics and hierarchy”. These last two Italian “symptoms” are what quite often slow down Italy’s progress on a national scale, as I’ve personally witnessed in nearly 19 years of Italian life (the public sector, at least in Rome, is one to avoid like the bubonic plague!!!). There is now in Italy a new debate on immigration given the fact that in Rome for example there’s a new right-wing mayor and the new Italian government also has in its coalition a rather large xenophobic contingent made up of Northern League members, apparently the most prominent in all of Europe. Most of the talk always and inevitably regards immigration in a negative light (such as the Romanian community that commits rapes or murders). Rarely though does anyone speak of the valid contribution that some “immigrants” such as Marchionne (albeit he was in fact born in Italy) can give to Italy itself. No siree, the immigration debate in Italy is still seen in a negative manner. Indeed a pity as exceptionally qualified people like Marchionne could actually do Italy a LOT of good and actually make it part of the First World (and NOT the Third World)! 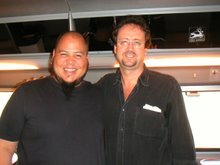 Me (on the right) with Abe Laboriel Jr., Paul McCartney's drummer!